Regardless if the employers in Romania contract Romanian or foreign individuals, they must fulfill certain obligations. Take note that under the Romanian law, in order to hire foreign citizens, employers in Romania must take some steps that, for non-EU citizens, are not very simple. Therefore, the difficulty of the employment process depends on the space from which the citizen who wants to be employed in Romania comes from. As a rule, the employment contract has to be concluded for an unlimited duration. The unlimited duration is a measure of protection for the Employee. By way of exception for project-based work, the individual employment contract may also be concluded for a limited duration, under the terms expressly provided by the law, maximum number of defined employment agreement is 3 successive ones, and the maximum period is 36 months. According to Article 13 of the Romanian Labour Code, the minimum age required to be employed is 16 years. A 15-year-old individual can be hired for certain activities which will not affect his health or professional development and only with the prior consent of the parents or legal representatives. The employment of an individual under the age of 15 is forbidden. For some positions specified in the National Classification of Positions in Romania are required superior studies and it is not allowed to hire an individual without the necessary qualification. The non-residents that come from countries out of the UE are usually employed with agreements concluded for indefinite period, because they need to prove stability and the fact that they will be able to support themselves during the term they will live in our country. To employ this type of non-resident, the Romanian employer needs to go through an entire procedure. Firstly, he must obtain the approval of the Romanian Immigration Office, and after this stage, the Employee may apply for the staying permit. For UE citizens it is simpler to conclude an employment agreement in Romania. If the period of their staying in Romania exceeds 180 days in one year, they have to register at the Romanian Immigration Office. After the conclusion of the employment agreement, all employees (residents, non-residents from UE or third countries) have the same rights and obligations in relation with the Romanian Employer. The Labour Code requires that an employment contract must be terminated in written form and in Romanian language. The contract may also specify provisions such as confidentiality, copyrights (in IT area) etc. The medical check before concluding the employment contract is mandatory. If this obligation is not met, the agreement will become null. The current minimum gross salary/month, valid starting with 1st of January 2019, is RON 2.080. Individuals having higher education and minimum 1-year work experience in the field of studies have a minimum gross salary/month of RON 2.350. As an exemption, for the employees from construction field, the minimum gross salary is RON 3.000 and special provisions are applied based on the Romanian legislation in force. The employee is entitled, according to the provisions of the Labour Law, to a minimum of 20 vacation days per year (working days, not calendar days). The employment contract can be terminated by notice given by each party. The termination notice period depends on the position ‒ management or execution. *As an exemption, for the employees from construction field, the minimum gross salary is RON 3.000. The employer is obliged to pay monthly contributions and income tax for its employees. The company also has a set of monthly social contributions due on the 25th of the following month for which the payroll is processed. *) for the construction field, in 2019, there are special provisions applied regarding due taxes and exemptions by case. The working day has 8 working hours and the week 5 days (40 hours per week). The maximum working time for a week cannot surpass 48 hours per week, including overtime. For the work performed in excess, the employee is entitled to an allowance. Employees are entitled, according to provisions of the Labour Law, to a minimum of 20 vacation days per year (working day not calendar day). For medical reasons, the employee is entitled to a medical leave allowance in amount of 100% or 75% of the average 6 months gross salary prior to illness period, depending on the cause of the incapacity. The employer is obliged to pay the remuneration for the first 5 days of incapacity from the medical leave period. The rest of the period is paid by the Romanian state; however, the employer shall credit the state with the amount paid to the employee. In maximum 90 calendar days, the employer should file a compensation request for above amounts to Romanian Health Insurance House. In cases of special family events, the Employees have the right to paid days off. These days are stipulated by law, collective labour agreement or Internal Regulation of the company. In order to solve special personal situations, the Employees have also the right to ask for unpaid days off. Meal tickets are optional benefit in kind, thus the company decides if they will be granted or not. The nominal value of a meal ticket is between RON 9,57-15,18. The value is decided by the employer. Meal tickets are deductible from the calculation of the tax on profit and exempt from the social contributions by both employer and employee. Meal tickets are taxed by the quota of 10% corresponding to the tax on salary income, payable by the employee. Are accorded only for worked days – 1 meal ticket/day. Are not accorded for delegation days with per diem and absence days (vacation, sick leave, labour contract suspension etc.). Meal tickets can be given on paper or electronic support/card. All the benefits are granted by the Employer to the Employees through provisions stipulated in the labour contract, the collective contract, Internal Regulation or through internal decision. The employment by temporary employment agency is an activity performed by a temporary employee who, at the direction of the temporary employment agency, carries out an activity for the benefit of a user. A temporary employee is a person working for an employer ‒ temporary employment agency and made available to a user for the duration necessary to perform certain, precise and temporary tasks. A temporary employment agency is a company authorized by the Ministry of Labour and Social Solidarity that temporarily provides the user with skilled and/or unskilled personnel employed and paid for this purpose. A temporary position must not surpass an initial duration of 24 months and can be renewed such that the total duration does not surpass 36 months. 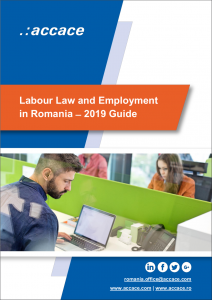 According to the Romanian Labour Code, the place of the work may be unilaterally modified by the employer by delegating or posting the employee to another workplace than the one provided in the individual employment contract. During the delegation or posting, the employee shall retain his position and every right set in the individual employment contract. The delegation is the temporary exercise by the employee, on employer’s direction, of works or tasks similar to his usual tasks, outside his workplace. A delegation may be directed for a period of maximum 60 days and may be extended, with the agreement of the employee, with maximum 60 days. A delegated employee shall have the right to payment of transport and accommodation expenses, and to a delegation benefit, under the terms provided for in the law or the applicable collective labour agreement. Posting is an act by which the employer directs the temporary change of the workplace to another employer, for the performance of certain works in its interest. By way of exception, the type of work may be changed during the posting, but only with the written agreement of the employee. The posting may be directed for a period of maximum one year. By way of exception, the period of the posting may be extended every six months, with the agreement of both parties, for objective reasons that require the presence of the employee with the employer where the posting was directed. An employee may refuse the posting directed by his employer only by way of exception and for duly justified personal reasons. The rights due to a posted employee shall be provided by the employer where the posting was directed. During the posting, an employee shall enjoy the rights more favourable to him ‒ either the rights with the employer directing the posting, or the rights with the employer he is posted to. The employer providing the posting must take all measures necessary so that the employer where the posting was directed fulfils completely and in good time all obligations towards the posted employee. The cross-border posting is regulated by Directive 96/71/EC and was transposed in Romania by Law no. 16/2017. An essential element of distinction between the two concepts is on the effects of posting towards labour contract. In the case of posting governed by the Labour Code, there is a suspension of the labour contract during posting (which implicitly assumes the suspension of payment of wages by employer). In case of cross border posting, the labour contract with employer that posts can be actively maintained. In this case, the salary will remain in pay at the seconding employer. Contact our experts in Romania!